As the first day with Chrysler in bankruptcy dawns, let’s look at a mad car from an era when the automaker was set to conquer the very skies: the jet-powered Gilda coupé. There is something definitely wrong with the heat exchangers of Italian air conditioners. Granted, they have fans in them and machines with fans will never be silent but cooling a small building by Lake Como should not require a jet engine. There, I said it—and as if on cue, this orange-silver concoction from half a century ago rounds a bend and motorvates leisurely down a service road. The noise is deafening, high, piercing, slightly dangerous. The Gilda—named after Rita Hayworth’s famous role in the 1946 film of the same name—is not a Chrysler in the way a 300 or a Hemi engine is, but it would certainly not exist without the company. Chrysler’s executives commissioned it in 1955 and it was designed by Giovanni Savonuzzi of Italy’s Ghia coachbuilding firm. The car was shaped to take a gas turbine, but it was never fitted with one: the Gilda toured the show circuit with a 1.5-liter OSCA four-pot, then was handed over to the Henry Ford Museum, where it sat until purchased by a Californian eight years ago for $125,000. Scott Grundfor, the car’s new owner, had the car restored and fitted, as originally intended, with a gas turbine. 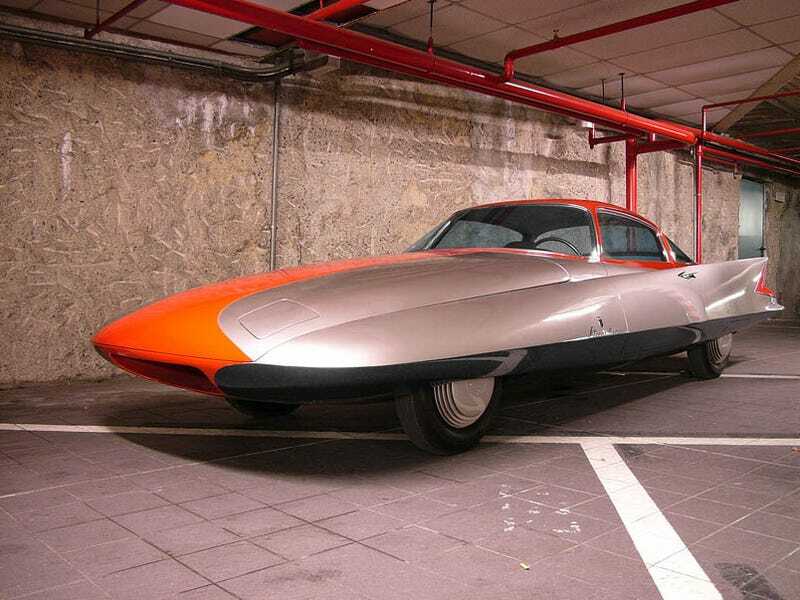 It’s a perfect complement to the styling, which, as you can see in our gallery, is perhaps the most extreme example of Fifties jet plane car design. A weird one-off from an era where ultra-high speed transport seemed to be just around the corner. And when Project Orion was not the name of a space program set to retrace our achievement from forty years ago, but stood for a set of spaceships powered by atom bombs. Yeah, the Fifties were cool. Postscript: Chrysler’s partnership with Ghia in designing a jet car culminated eight years later in the Chrysler Turbine Car, a test run of 50 automobiles powered by the A831 turbine engine making 130 HP at a very un-V8 60,000 RPM. While the cars were reliable, they never made it into production, and died quick EV1 deaths.